Bulletin of the "Friends of Mount Zion"
I am absolutely delighted to be writing my first letter for The Dial, and more importantly for me , to be the new minister for Mount Zion Methodist Church. Not only does Mount Zion provide a superbly preserved centre for Methodist Heritage, but it is also a focal point for an amiable and dedicated group of people : you, the congregation, who have made me feel so welcome since I moved to North Halifax just over two months ago. This combination of heritage and congregation is perfect : surely all visitors to the chapel can sense the care, fondness and love of Christian worship that you have all invested into this strong yet friendly building. I know I can ! ­ and I remain as intrigued as ever by this place, and the enthusiasm it inspires in you. I look forward to a future, where I can learn more about the past of Mount Zion, and explore it in our everyday worship together. As I glance through the last edition of The Dial, I am happily reminded that next year is a momentous one : the three hundredth anniversary of John Wesley's birth. People's thoughts will naturally turn to the various Methodist buildings of historical significance throughout this country. Our Chapel, and those who care for it, are always ready to welcome and satisfy interested visitors. Next year will also be an ideal time for us to worshipfully examine Mount Zion's meaningful role within the Methodist Church, as well as Methodism's role within the world. We are a well-established movement, but we continue to live and grow. Before the new year begins, however, we have Christmas ! I can't wait to join you all in our Carol Service. I'm sure that while it might be freezing cold and inhospitable outside, the atmosphere inside will be warm, welcoming and full of hope. Christ's birth is the bright star in our winter sky : Let us celebrate. This year the Christingle Service and Carols will be a little different. It will not be with candles but with torches. If you are coming along please bring a torch with you - nothing fancy is necessary, just a torch which will give some light. We are advised by the Fire Service of the danger of having a lot of candles in a building, especially ones which are held in the hand. We felt we should take that advice - also we have a new carpet and we don't want candle grease on it. There will be some Christingles on the communion table and an advent ring on the stand. Birth of Jesus Christ - a light to the world. Quite a lot of what we have done at Mount Zion is reported in the Past Events below, but there are one or two other interesting matters. We had a two sheet spread in the "Heritage" series in the Methodist Recorder. This is a series which has been in the "Recorder" over the past few years and I thought we warranted an entry but I did not expect that we would get so much space. We also had a number of photographs as well. Thanks to Anthony Greenwood for supplying a zipdisc with the photographs for the "Recorder" to use. We had quite a number of responses from the publication. 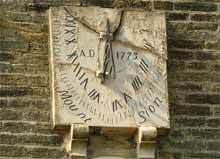 Perhaps the most unexpected was from the Chapels Society pointing out that the sundial on the front of the chapel had been altered. Investigations were made and lo and behold it was very apparent that it had been overpainted. Just goes to show how well we look at the familiar because none of us at Mount Zion had noticed it. In 1973 it was as originally made - having the number V at the top right, number XII at the bottom centre and IV top left. The words Mount Sion and the gnomon for the correct time. It now has the numbers going round from I at the top right to XII top left and minutes have been painted on. You can still see the original numbers as they were carved in the stone but the present ones are painted black. We received a letter from the Property Division of the Methodist Church suggesting that we have it restored to its original form and they will give a grant for that to be done. We are in the process of following that up. It would be lovely to get it restored as it is at present in a rather decrepit state. The possible repair of the Anneessens organ is under consideration. Malcolm Spink is hoping that a part to boost the amount of air coming into the organ will be the answer to the problem. If that does not work I am afraid the organ will remain as it is - unless someone can come up with £100K. www.mountzionhalifax.org.uk is up and running and is wonderful. We now have pages on the history of the site, the Sunday School, graveyard plans and burial records, photographs, memorials (including war graves) and a notices page. Those of you with access to the internet must have a browse. We have had a lot of E-mails as a result notably from Canada, U.S.A. and New Zealand and visitors from this country at a Sunday Service and staying in the locality specially to come and see Mount Zion. Our thanks go to Anthony Greenwood and his family for the hours and hours put in to getting the site up and running. We hope you will be able to come along to the Service at Mount Zion. We know that it is the date of our Anniversary Re-union but we feel that is very appropriate. We hope to fill the Chapel. We seem to have done a lot during the past six months or so, but of course, it has been "summer" when things go apace. Sunday 28th April 2002 ­ Gift day and songs of praise. This was a lovely service, with a good congregation, led by Rev. John Lambert and Stephen Illingworth accompanying the singing of ten hymns. It included the dedication of the Communion kneeler in memory of Muriel Jagger and the flower stand in memory of Edith Reeve. Collections amounted to £125.15p. and gifts totalled £505.Thanks to all who gave so generously. We were glad to welcome Betty, David and Christine Jagger, Muriel's family, and it was lovely to have Mrs. Aline Pendlebury with us. She was staying with her friends Peter and Muriel Wood and several of us were invited back to their home at Harden for tea and fellowship. We also had with us at the service Mr. Baxter and his family. Mr. Baxter made the flower stand. This service was led by Rev. John Lambert and the preacher was Rev. Dr. Nigel T Collinson, Secretary of the Methodist Conference. Singing was led by the Halifax Circuit Choir and Stephen Illingworth was organist. Collections amounted to £188.40p. and afternoon tea was served in the cottage. This was the last time we were able to use the cottage until August as the following Wednesday we moved everything out so that repairs could begin. Thanks are expressed to Mr. Andrew Mitchell and boys from the Boothtown Boys Brigade Company for the help they gave in moving out furniture, kitchen equipment, carpets, etc. They ultimately came back in August to put everything in its rightful place. They did a great job. This was our first Open Day of the year and Irene and Mavis sat there all afternoon but not one person arrived. England 3 Denmark O - need we say more??????? Sunday 7th July 2002 ­ Aniversary and Reunion. This year just one service was held in the afternoon and the usual tea was not possible because of the state of the cottage.The preacher was Rev. John Gilyead of Ilkley and the Circuit Choir led the singing with Stephen Illingworth at the organ. Collections amounted to £190.80p. plus donations of £125 from friends who were not able to attend. Thank you to all. In the evening there was a "Celebration of Ministry" at King Cross when gifts were presented from the Circuit to Rev. John and Mrs. Sue Lambert and the Revs. Stuart and Jane Wild prior to their moves to other Circuits. On this day Mr. John Hirst from Epworth came to visit Mount Zion. Mr. Hirst is an artist who is preparing a book about Methodism and places where John Wesley Preached. He is going to paint a picture of the cottage from the large gate at the side. When this has been completed Mount Zion will be given first chance of having the painting. Mr. Malcolm Warburton, Wakefield Diocese Tourism Officer, also came to take photographs from outside and inside the Chapel. This is for a tourism leaflet of places of interest in the area. Sunday 28th July 2002 ­Last service at Mount Zion of Rev. John Lambert. John reviewed his five years with us and it was quite a nostalgic service. We do not have many baptisms at Mount Zion, especially Adult Baptism, but on this day Mr. Stuart McArthur was baptised. Stuart had not been baptised as a child because his father was away in the Army and he had expressed a wish to be baptised and this formed a very moving part of the service. Stuart, Jill and Alice (Guide Dog for those who don't know) are very staunch supporters and attenders at Mount Zion and it seemed especially appropriate that we should welcome Stuart into the family in this way. We were invited to Illingworth Moor for a Faith Tea following which tributes were paid to John and Sue and they were presented with gifts from Illingworth Moor and Mount Zion. During the evening service John was interviewed by Geoff Widdop in "This is your Life" style entitled "Face to Faith". We wish John and Sue happiness and fulfillment at Gerrard's Cross. Note: They have settled well and seem to be enjoying life. John says something about "what are evening meetings.........". How lucky he is not to have as many meetings as he had in Halifax. We might ask what he is doing with all that spare time!!! This was held at King Cross when we welcomed to the Circuit the Rev. Judith Satchell (from Sheffield) who is to have pastoral oversight of Salem and St. Andrew's, and Rev. Cyril Blount, a supernumerary minister from Huddersfield, who is to have pastoral oversight of King Cross and Ebenezer working in the Circuit for three days each week and taking services on Sundays. We also welcomed Ruth Needham, a layworker who will be serving Ebenezer and Southowram on two days each week and Mr. Bill Place, also from Huddersfield, who is to take up duties as Circuit Administrator each morning Monday to Friday. Mr. Les Sisson is now working full time in the Circuit and other Circuit Ministers are moving around within the Circuit. This was the launch of the New Look Halifax Circuit and we hope that it will be challenging and exciting. The Rev. Lisa Quarmby has moved from King Cross to Illingworth and will have pastoral oversight of Mount Zion, Illingworth and Mount Tabor and will live at Whitehill Road. The service was led by Rev. Lisa Quarmby, a first service as our minister but who has been on a number of occasions previously. Stephen Illingworth played the organ. The ladies produced their usual lovely display of fruit and flowers which were later taken to the sick and elderly. Collections amounted to £55.50p. On the Saturday we were open from 2-4 p.m. when we had 16 visitors and on Sunday 10-12 noon (7 visitors) and 2-4 p.m. when visitors joined us in worship at 2.45 p.m. Rev. Cyril Blount was the preacher and Stephen Illingworth played the organ. It was the Rev. Cyril's first visit to us since joining the Circuit and he led a rousing service - subject HERITAGE. It was much appreciated by all who were there, especially the visitors and was so very appropriate for the occasion. Thank you Cyril. This was the last of our open days for 2002 when 40 (yes forty) members of the North Lancashire Wesley Historical Society came to visit. They were given a lecture about Mount Zion, then had their AGM, looked round and had tea. They were extremely interested in the Wesley Display and Mount Zion Heritage and they enjoyed their tea, when they filled the cottage. Forty is the limit for a sit down tea!! Twelve friends from Salem joined us in worship when Andrew Stopford was the preacher and Doreen Maddy placed the organ. Tea and fellowship followed in the cottage. Their minister, Rev. Judith Satchell, Paul her husband and Hilary their daughter, came along with them. Rev. Lisa Quarmby was the preacher and Mrs. Doreen Maddy the organist. Judith Whiting visited to take photographs and look at manuscript books of music. Judith is involved with the West Gallery Music Association which is formed to study, revive and enjoy Church Music of the Georgian period. She also visited Illingworth Moor and Mount Tabor. She was interested in Churches with Galleries and was very impressed with what she called a "well loved building". Mollie was a Lancashire lass but loved Yorkshire - Halifax in particular and Mount Zion especially. During the war she was in the Land Army and later she and her husband, Jim, lived for many years in London where she was a member of the League of Health and Beauty and was Area Manageress of a firm having kiosks selling sweets and cigarettes. From one of them she used to see and wave to a young Prince Charles and Princess Anne, out with their nanny. During her latter years she suffered much ill health but was always happy and cheerful. She spent her time making knitted toys, especially Worzel Gummidge, which were sold for Mount Zion funds and for the Haemotology Unit at the Hospital where she was treated. Her favourite hymn was "All things bright and beautiful" and it was always her choice for our Songs of Praise Services. She had not been well enough to attend services at Mount Zion for some time but will always be remembered for her happy nature and great faith. Mollie died on the 4th of July 2002 aged 82 years. We remember Rosalind and her family and send our condolences on the death of her mother. In the December 1998 issue of "The Dial" there was an item about the Rev. George Bramwell Evens, who came to be known as the first natural history broadcaster though his broadcasts as Romany on BBC Children's Hour - and we must not forget Raq his spaniel. He has at last been honoured with a plaque on his cottage at Sandsend, paying tribute to "Rev. G. Bramwell Evens as author, naturalist and boradcaster. It was at this cottage he wrote 'Out with Romany by the Sea' in 1941"
He began his writing career in 1929 when he was at King Cross Methodist Church. His stories of the countryside captured the imagination of children and inspired some to become internationally famous naturalists. Among his many fans were David Attenborough, David Bellamy and Gerald Durrell. Terry Waite, who is patron of the Romany Society, was responsible for the plaque on the cottage. Romany lived for a time in a caravan at Sleights, but after a serious illness in 1937 he recuperated at his cottage at Sandsend. This was demolished during the Second World War when a mine exploded and he then bought the present one where he lived for a few years before moving to Wilmslow where he died in 1945. One of his books 'Romany in the country' has been reissued by Isis. I wish it a great success. Romany's books are so refreshingly gentle and innocent - how different from many of to-day's books which portray envy, violence and aggression. Should this be a success maybe the Society will reissue more of Romany's works and bring them to the attention of young children of to-day. This Bulletin, No 26, is produced by courtesy of the "Friends of Mount Zion"